Women's cotton lined fleece bath wrap is made of 55% Turkish Cotton and 45% Polyester Fleece. Terry cloth interior, fleece exterior spa wraps are designed for maximum comfort and absorbency. These absorbent shower wraps can be used for bath, spa, shower or pool. Features front pocket and velcro closure. - Wash and dry with velcro closed. - Wash and Dry velcro closed. - If you see a pulled loop on your bath wrap, please cut the pulled loop with a pair of scissors. This will not damage the item. 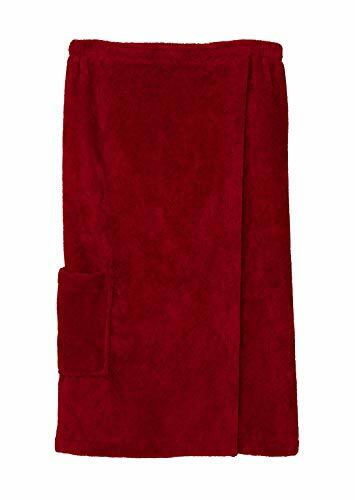 WOMEN'S SHOWER WRAP - Terry lined fleece shower and bath towel wrap for women. This bath wrap is designed for comfort and absorbency. Great for bath, pool and hot tub. It is double stitched for durability. Features front pocket and velcro closure. PERFECT GIFT - Women's shower wrap is the perfect gift for your loved ones. Exterior of the shower wrap is made of plush polyester fleece and inner lining is absorbent Turkish Cotton. This absorbent shower wrap can be used for bath, spa, shower or pool. Three different sizes available. SIZE CHART - SMALL/MEDIUM: Length: 29.9 inches. MEDIUM/LARGE: Length: 31.5 inches. LARGE/X-LARGE: Length: 32.3 inches. MADE IN TURKEY - Women's bath wrap is made of of 55% Turkish Cotton and 45% Polyester Fleece. Wash and dry with velcro closed. Machine washable, wash in warm water. Tumble dry low heat. CONFIDENCE IN TEXTILES - We believe in all our products. Our products are tested for harmful substances according to Oeko-Tex Standard 100. No matter your age you can get a lot from a shower wrap and we can help you find the right size and style. If you have any questions about this product by TowelSelections, contact us by completing and submitting the form below. If you are looking for a specif part number, please include it with your message.